Bertolaso corkers and cappers offer a variety of closure types for still and sparkling wine, spirits, olive oil, and fruit juice industries. 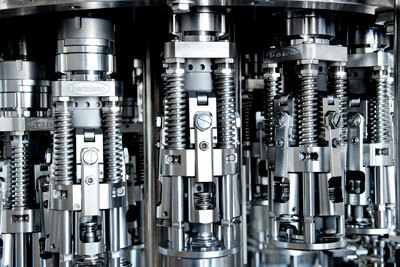 ColloPack represents Cames for cork orienters and cork and cap feeders. Bertolaso offers single head and rotary corkers for natural, synthetic, and sparkling wine corks that operate at 40 bpm to 500 bpm. The corks are compressed with Bertolaso’s patented four-jaw compression system, which ensures uniform compression during the wine bottle corking process. Bertolaso corker options include a vacuum/gas/vacuum system to sparge the head-space prior to cork insertion, adjustable star wheels, quick-release system for cleaning the compression jaws, quick release bottle centering device for cleaning, and electronic height adjustment. Bertolaso also offers machines that have been specifically designed for closures to be inserted by pressure such as bar-top style used for spirits and plastic sparkling wine corks. Bertolaso offers single head and rotary capping machines for still wine, olive oil, vinegar, and fruit juice that operate at 40 bpm to 500 bpm. The wine bottle capping machines have been specifically designed to apply roll-on, ROPP aluminum caps (long and short skirts), pre-threaded plastic caps, and a wide variety of new wine and spirit closures. Bertolaso cappers also have the ability to sparge the cap and bottle head space with inert gas.